I can clearly remember the first time I heard Michele Ari's music. We had connected on MySpace of all places, where it's incredibly easy to ignore musicians because there's so many and most of them aren't very good, but that just wasn't possible with Michele. There was something special about her that instantly drew me in and made me click to play her song "My Sleeping Beauty." 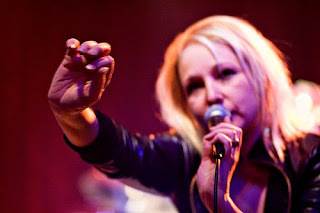 What I heard coming out of my speakers sounded like what might happen if you could infuse Echo & the Bunnymen's "Killing Moon" with the essence of Debbie Harry, the spirit of old school R.E.M. and 10,000 Maniacs, and a dash of the Ronettes for good measure. Before half of the song was over I was a devoted fan. Michele and I quickly struck up a friendship and I've known her now through a series of adventures and misadventures, all of which have lead up to this month's release of her new EP, mal a' propos (French for "out of place"). She currently lives in Nashville and is coming to town to play her first Chicago show Saturday, November 21 at Cal's Bar (400 S Wells, 10 p.m., $5) with A Sample Life, Tommy Ache & the Terrible Mistakes and The Streets on Fire. She will also appear on Fearless Radio at 4 p.m. central the same day. To prepare for the show, download the opening track from mal a' propos below and read on for an interview with one of my favorite musicians and friends. Download MP3: Michele Ari - "6 a.m."
WCR: It's been while between your first release, 85th and Nowhere, and the new EP, mal a' propos. For those who don't know you, what have you been up to? MA: Well, mostly I have been hanging out at the spa. No really, after the release of 85th and Nowhere I had a nice surprise which was that the record was attracting a lot of attention in the U.K., so I came up with a plan to explore the possibilities of what I could make of this exciting news. Sadly, in the end, my plan could not be executed. The result was very costly, not just in terms of money, but in every way. The time I spent on this plan was gone. The hopes and dreams for this idea of mine went out the window as well, so during this time I was keeping everything I could going while coming up with some new dreams - interim ones if you will. At the time I had left Florida - where I had lived for a few years, played shows and recorded 85th - to pursue this particular idea of mine. When the plan did not work out I didn't want to go back to Florida. I spent time in Chicago, Athens and Atlanta, and while these were nice cities and I made new friends and contacts, I wasn't loving being there. I had very little money and I wasn't exactly in the greatest mood to boot. One night I got lost on my way to Atlanta. Every street there is named the same thing and it was late so I gave up and slept in my car in the parking lot of a hotel. As I fell asleep I tried to place myself back in suburbia - where I grew up - for some comforting thoughts of when life was “easier," but all I could wonder was "how could this happen?". I was surprised I had failed to do what I set out to do and was at a complete and total loss. I can tell you it did beat the one night I spent in a tree-house with a madman in Athens. But that's another interview. So how did you finally end up in Nashville? A poet friend of mine had urged me to go to Nashville and I shot his idea down every time. While I was still in Atlanta I called my friend up and told him I wasn't getting anywhere there. Once again he brought up Nashville. Since my ideas, thus far, had not been very good ones I decided to at least explore his idea. I decided to post on Nashville's Craigslist asking how people liked Nashville and what people's thoughts were about going there, particularly if they didn't play country music. I ended up getting back some really nice responses. One of them was from a little known band. I proposed that they be my back-up band and that I would book shows for them in return. So, when I arrived in Nashville I had a band before I even had anywhere to live which was fine by me. I think I placed my ad on a Tuesday and by Sunday I was gone. How has everything been working out there since? It's been a lot of work, but in general this was a smart move. With all due respect to the amazing venues here I refer to Nashville as “one big rehearsal space.” I'd venture to say that I am certainly on the fringe of the scene here and I have nothing whatsoever to do with Music Row and The Bluebird Cafe, but in many respects I think it's the best thing for me. My outlook and reach for what I am doing and my vision for what I want extend well beyond a single city- even “Music City.” I've long since parted ways with that original band I had here and just worked to improve things every step of the way. I cried the day I dropped my masters for the new EP in the mail to be sent off for duplication and packaging. There have been a lot of barriers resulting in built-up emotion leading up to this moment. People often ask me where I am from and I simply say "all over" and hope they drop it. If they don't and they are really interested, then I know I have just made a new friend. Nashville is a great place in that there is a large pool of musicians to choose from, it's in a decent location as far as touring and when you play a "local" show you are probably playing at one of the top venues in the Southeast, if not the world. And you could probably have a drink with Jack White one way or the other, but these days I don't get out much. When I do, though! It's interesting that, as you mentioned before, 85th got quite a bit of attention in the U.K. Why do you think it worked out like that? I think there is an acceptance of more off the beaten path artists and a larger disdain there for pop than we have here, generally speaking. So much of my influences and what I personally love to listen to comes from the U.K. so in that way it makes sense. I am guessing there is an aesthetic to what I do that seems to resonate with Brits. London really is the cultural center of the world and I was, and still am, very flattered by the response. If I moved there I wouldn't take on a phony accent. though. That's really silly when people do that. Is there any one review or comment you received for 85th that particularly stands out? One of my favorite tokens from that time period is a copy of a book written by Chris Dawes, an author and former journo for Melody Maker which is now NME. The book Rat Scabies and The Holy Grail was about Chris's adventures with the former drummer for The Damned wherein they went looking for the grail. When I opened the copy of the book he sent there was a note from Chris wishing me well and a note from Rat that said "To Michele, the best musician I have ever heard.” Naturally it's not a true statement, but I value the sentiment enough that no one is allowed to borrow my book! Wow, that's pretty awesome. No wonder that one stands out. Moving on to the new EP, you decided to title it mal a' propos, a French term that means “out of place.” Why? 85th had a clear and definite theme. The songs tell a whole story thanks to the inspiration at hand. Mal a' propos had a different evolution because my life was different. The writing for it began and then a series of different adventures ensued. When the dust finally began to settle I was hard pressed to tie things together. I looked at my life, the songs for this new record and the ups and downs to getting it made. The songs, the stories behind them and the girl who wrote them all seemed a little bit out of place. Finding the term "mal a' propos" itself was a bit of a fluke. I was having a meeting with photographer Richard Call about the record's photo shoot and we stumbled across the term online in a very happy accident. So I should give Richard credit for finding it. But I immediately fell in love with the word and knew I had my title. Let's talk about some of the individual songs. The EP starts off with “6 a.m.,” which builds up slowly and then bursts into a very cool, almost rock-disco number. Is that the plan you had for it all along? It started off as a really bad folk song as many songs do when written on an acoustic guitar. Naturally it wasn't my intention to leave it that way and it never got performed in its original state. That was one of those songs where I wasn't sure where it was going until I had a full band working on it. Then I knew it was headed to the disco. The idea for the little rant there before the last verse was not mine. I've since moved, but my neighbor at my first place in Nashville, Greg Urbaitis, was one of the original members of The Queers (another nice little perk about being in Nashville). I would bring my rough versions to him and, in fact, he did lend his thoughts on arrangements to the mal a' propos songs. He suggested that space in “6 a.m.” needed a little something so I wrote the “rant” you hear. You don't hear a lot of spoken word bits in songs anymore. I'm glad you went for it. There might be a reason for that! I get the idea I generally do a lot of things people don't do. Thank you, though, of course. Do you have a favorite off the EP? I don't actually, but I do think that "Atom Bombs" turned out very nicely. I've test run the songs on a handful of people and with the feedback from the producer and engineer I am finding people have different favorites. This is good news to me because maybe that means there isn't just one good song on there. That song, “Atom Bombs,” is very relatable, which of course is one of the keys to great music. "Sometimes my head explodes like atom bombs." Amen to that. I find "Don't Go" to be a very cool tune because it's the sort of straightforward, immediately catchy three-minute pop/rock tune with no gimmicks or pretense, and you don't hear that from a lot of indie or alternative acts now. How did that song come about? Thank you. When I first started making music I made myself a promise to be real and to be honest with myself. I didn't want to make music that lacked substance, and that did not mean every song had to be lyrical genius or that if I did not write as well as Elvis Costello that I was not a songwriter. “Don't Go” was started one night in a popular West Nashville bar on the proverbial cocktail napkin. I was there one quiet night and was dismayed that no one was talking with me, not that I cared particularly. But it struck me as odd , perhaps sad, that nobody was talking to one another. The thought came to mind that they could be missing out on someone or something important or, at best, interesting. I took the few lines I had written and applied them to my personal circumstances at the time. The lines that begin," Is there a light at the end of this path?" not only sum up that one experience, but generally how I have felt for some time about a handful of things, and if there is some tie-in for mal a'propos with my life, that's probably it. I think the answer to that line is "yes.” I remember when I was a kid reading this brochure for Disney World with a quote that said "getting there is half the fun.” I think of that sometimes and I hope I will think that looking back. So when planning this tour what made you you choose to play Chicago? Because you live there so it's an excuse to see you. Actually, you've been a great friend and I really do want to give people the chance to come to a live show who have been there for me all along, particular those who never went away in the time between 85th and mal a' propos. In some ways it was the venue itself. Cal's and I have been “MySpace friends” for some time and I just think it looks like a cool little dive bar that would be fun to play. Plus Chicago is a big city and I am likely to fare better in a big city than a small town. My luck in small towns is not so great. I played a show in a small town near Nashville and I think people were mad they couldn't hear their Nickelback songs on the jukebox. At one point I was being so badly ignored that I started reciting the lines to a commercial I memorized when I was a kid. I don't think they noticed. I don't think they would have noticed if I took my clothes off and lit myself on fire. Potentially one day I will.